Marcus Mariota is one of the most outstanding quarterbacks the Tessessee Titans of the National Football League ever had. Drafted by the Titans in the NFL draft of 2015, Marcus was the second overall prospect to be selected in the draft. He played college football with the Oregon Ducks football team from 2012 to 2014. Following his impressive college career, Marcus recorded several awards in his name including the Heisman Trophy, Walter Camp Award, Manning Award, Maxwell Award, Davey O’Brien Award, and Johnny Unitas Golden Arm Award. In addition, he won Pac-12 Offensive Player of the Year, AP Player of the Year, and Sporting News Player of the Year Award. He was equally named Unanimous All-American and All-Pac-12 first-team three times consecutively. Born Marcus Ardel Taulauniu Mariota in Honolulu, Hawaii to Alana Deppe-Mariota and Toa Mariota; Marcus first came into this world on October 30, 1993. He holds an American/Hawaiian nationality and belongs to Samoan and German ethnic origin. Developing a keen interest in football from a young age, Marcus was inspired by the Samoan Quarterback Jeremiah Masoli. He went on to attend Saint Louis School in Honolulu where he participated in several sporting activities including track and field as well as football. During his senior year, he led the St Louis team to win the state title with a record of 11 – 1. He won PrepStar Magazine All-West Region as well as Interscholastic League of Honolulu Offensive Player of the Year. Finishing his high school career in 2012, he was named to the NUC All-World Game and was honored with the Hawaii Gatorade Player of the Year Award in 2010. Upon graduation from high school, Marcus was sought after by many universities with attractive scholarship offers. He went on to attend the Oregon State University where he continued his college career. Playing for the Oregon Ducks, Marcus featured in 13 games in his freshman year; leading the Ducks to finish second in the league with a 12 – 1 record. He won Pac-12 Freshman Offensive Player of the Year Award as well as the Offensive MVP of the 2013 Fiesta Bowl. In his sophomore year, following his outstanding performance, he became the only player in Oregon history to notch 4,000 yards in a season. He also won the 2013 Alamo Bowl Offensive MVP. Marcus recorded his career best in the 2014 season after which he won series of trophies including the Heisman trophy, Maxwell Award, Davey O’Brien Award, and Walter Camp Award, among others. In 2016, Oregon launched a 30,000 square-foot Marcus Mariota Sports Performance Center built in honor of his outstanding records in the school history. Joining the 2015 NFL draft, Marcus Mariota was picked by the Tennessee Titan as the second overall pick in the second round of the draft. He signed a four-year contract worth $24.213 million which includes a signing bonus of $15.870 million. Currently, in his fifth season for the Titans, Marcus finished his rookie year with a record of 12 games, 19 touchdowns, and 2,818 passing yards with 10 interceptions. In 2016 season, Marcus had 26 touchdowns and 3,426 passing yards with 9 interceptions. He was named an alternate to the 2017 Pro Bowl and was ranked No 50 on the NFL List of Top 100 Players of 2017. During the 2017 season, he notched 13 touchdowns, 3,232 passing yards, and 15 interceptions. The Titans took the fifth-year option on Marcus’ contract on April 18, 2018. Marcus is one of the top-notch quarterbacks of the NFL and he has a distinctive rare straight-line speed. His ability to create outside pockets has helped him win crucial games for the Titans; nevertheless, it could make him prone to injury. In addition, he has great balance and excellent balling skills which have helped him to maneuver injury spots. Since the inception of his professional career; Marcus has not incurred injuries capable of keeping him off the field for a long time. Mariota comes from an athletic family; he was born to Alana Deppe-Mariota and Toa Mariota and grew up along with his only brother Matthew Mariota. Just like Marcus, Matthew also plays college football with the Oregon Ducks in the position of tight end. Currently in his junior year; Matthew is also a sociology major. While there is no much information regarding Marcus’ parents, he has been in a few relationships to date. He is currently dating Kiyomi Cook. Cook is a middle school girl soccer coach; she was born in Gresham, Oregon to Karl Cook and his wife Carol. She grew up along with her two siblings Kevin and Kerri Cook. The three siblings are into soccer; Kerri played soccer for the Tennessee State University team while she pursued a degree in nursing. Kevin, on the other hand, graduated from the University of San Diego where he also played soccer for the school team; he has a degree in Civil Engineering and is currently coaching Seattle United soccer team. The lovebirds first met themselves while they were at Oregon State University. 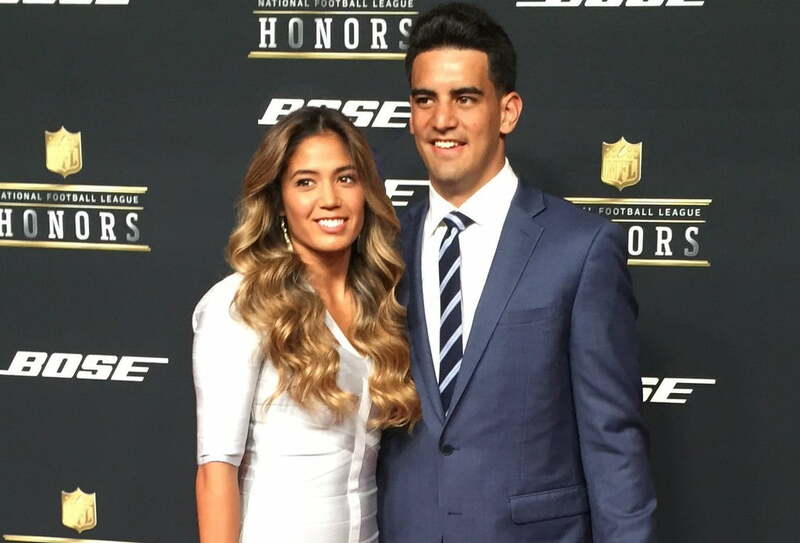 Their relationship saw the light of the day in 2015 when they were spotted at the Mariota’s NFL draft party held in Honolulu, Hawaii. After that, the duo has always been spotted severally at public events. Cook has a degree in human physiology and has been working as a middle school coach for the University School of Nashville since September 2015. Prior to their relationship, Marcus was with a lady named Nicole Watase.